TimeOuTbilisi - Read TimeOuTbilisi and explore Georgian society and history, discover the beauty of the country and learn more about Georgian culture. Make Georgia an adventure with your I. Read TimeOuTbilisi and explore Georgian society and history, discover the beauty of the country and learn more about Georgian culture. Make Georgia an adventure with your I. A Georgian legend says that one day, while King Vakhtang Gorgasali was in the forest, his falcon chased a pheasant. The bird fell into a hot water spring and the king and his servants saw the steam coming off the water. 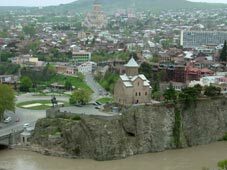 Surprised by this abundance of hot water, Vakhtang ordered a city to be built on this site, called it "Tbilisi"-"the site of warm springs" - and made it the capital of the country. A street and a square now bear King Vakhtang's name, and a 1967 monument by the sculptor Elguja Amashukeli stands on the Metekhi cliff. Vakhtang is the subject of several folk poems and legends extolling the king’s perceived greatness, enormous physical strength, courage and devotion to Christianity. Vakhtang was officially included in the Georgian Orthodox Church calendar –the Church commemorates him as the Holy and Right-Believing King Vakhtang on November 30. Vakhtang has been credited with the foundation of several towns, castles and monasteries across Georgia. The Vakhtang Gorgasali Order, created in 1992, is one of the highest military decorations in Georgia.